Modern slavery and human trafficking in the UK is "far more prevalent than previously thought," the National Crime Agency has said. 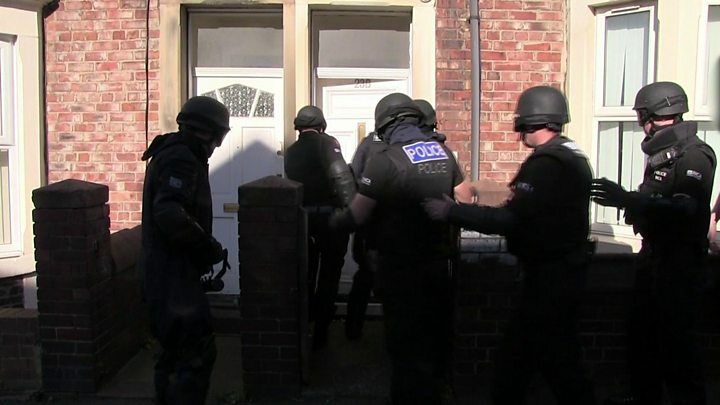 The NCA said there were more than 300 live policing operations currently, with cases affecting "every large town and city in the country". The agency estimated that there were tens of thousands of victims. It said previous estimates of 10,000-13,000 victims in the UK were found to be the "tip of the iceberg". "The more we look, the more we find," the NCA's vulnerabilities director Will Kerr said. Mr Kerr said he had been shocked by what he had seen during this year's intensive efforts to break up gangs, with almost every major operation triggering even more investigations. He warned that trafficking into modern slavery was now so widespread that ordinary people would be unwittingly coming into contact with victims every day. The NCA said the growth in modern slavery was being driven by international gangs increasingly recognising the amount of money they could make by controlling people within a huge range of economic sectors, rather than just dealing drugs. It warned that the key sectors for slavery now included food processing, fishing, agriculture, construction, domestic and care workers and car washes. "As you go about your normal daily life there is a growing and a good chance that you will come across a victim who has been exploited and that's why we are asking the public to recognise their concerns and report them." Modern slaves in the UK, often said to be hiding in plain sight, are working in nail bars, construction sites, brothels, cannabis farms and in agriculture. Traffickers are using the internet to lure their victims with hollow promises of jobs, education and even love. Albania, Nigeria, Vietnam, Romania and Poland are the most likely countries of origin, but some victims are from the UK itself. There is no typical victim. They can be men, women or children of all ages but it is normally more prevalent among the most vulnerable, minorities or socially-excluded groups. Many believe they are escaping poverty, limited opportunities at home, a lack of education, unstable social and political conditions or war. But their slave masters are usually out to make financial gain. Sexual exploitation is the most common form of modern slavery reported in the UK, followed by labour exploitation, forced criminal exploitation and domestic servitude. People from Eastern Europe, Vietnam and Nigeria were the most common victims brought to the UK, Mr Kerr said. He gave one example of a 12-year-old Roma girl who was stopped at border control and had been bound for a life as a domestic slave. He said: "She was being brought in to work for a family in part of the UK, where she had effectively been sold by her father - or it had been facilitated by her father - and she was being brought in to take this family's children to school and pick them up every day, and clean the house in between. "Twelve years old, same age as my youngest son." Mr Kerr said criminal charges were pending against those involved in the case. He added that the problems authorities are facing are further complicated by the fact some people do not realise they are a victim of slavery. Media captionWhat has the National Crime Agency found in investigating modern slavery? This stark assessment of the growing scale of modern slavery is a story of our times: Criminal gangs looking to maximise the profits from globalisation by coercing and controlling people, as they move them around the world like commodities. It is obviously impossible to fully assess a hidden problem. And while the NCA says it has been shocked by what it has seen over the last six months, there are also criticisms. On Wednesday the anti-slavery commissioner questioned in an interview with the Evening Standard whether the NCA had previously failed to act quickly enough on its own existing intelligence. In its defence the agency says there has been a "sea change" in response across the board. Four years ago the former home secretary, now Prime Minister Theresa May, said it was time for a tougher response. The question remains whether this extraordinary modern crime has grown because too little has been done since then. The Modern Slavery Act was introduced into law in 2015. It states an offence is committed if someone holds another in slavery or servitude or requires them to perform forced or compulsory labour. The legislation also increased the maximum jail term for people traffickers from 14 years to life. Cherie Blair, the human rights barrister and anti-slavery campaigner, said the revelations came as "no surprise whatsoever to anyone who's been working is this area". "Modern slavery's always been a hidden problem and what's happened since we passed the Modern Slavery Act in 2015 is more and more light is being thrown onto this problem, and rather like child abuse in the past, it's always been there but people were not aware of it, and as they become more aware of it, we uncover the true extent of the problem." Figures released earlier this year by the NCA showed the number of suspected victims of slavery and human trafficking had more than doubled in three years. It said there were 3,805 people reported as potential victims in 2016 - an increase from 1,745 in 2013. A Home Office spokesman said the government had taken "world-leading action" to tackle modern slavery, including toughening up sentences and increasing support and protection for victims. "We continue to support the work of the National Crime Agency to leave criminal networks of traffickers and slavers nowhere to hide. "Earlier this year we launched the Joint Slavery and Trafficking Analysis Centre to provide high quality intelligence analysis to assess the threat posed by modern slavery, and to support an increased operational response to this horrendous crime."